In addition to ultrasound, endoscopic procedures are also offered. Endoscopy entails passing a thin, long camera into the body to directly visualize internal structures. This procedure is noninvasive and painless but is performed under general anesthesia. Rhinoscopy (nasal endoscopy) involves evaluation of the nasal cavity, nasopharynx (space above the soft palate) and pharynx (throat area). This procedure is most commonly performed in dogs, who are often afflicted with nasal tumors, nasal foreign bodies such as grass or sticks (I once removed a peanut from a dog’s nose…in Suffolk nonetheless) and chronic inflammation in the nose (chronic rhinitis). Depending on findings, biopsies or culture may be obtained. The procedure is also performed in cats, although cats pose more of a challenge due to their smaller size and shape of their nose. The procedure is most commonly performed in cats when there is suspicion of a nasal tumor or polyp. Unfortunately, the procedure is not as helpful as one would expect with chronic upper respiratory infection, a very common and frustrating condition to treat in cats. It is vital that the pet be fasted overnight and dropped off the morning of the procedure. The procedure is usually scheduled in the morning whenever possible, although sometimes scheduling may require an afternoon time. An IV catheter will be placed before the procedure, your pet will be anesthetized with placement of an endotracheal (breathing) tube. Your pet will be monitored closely during anesthesia by one of your veterinarian’s staff members. 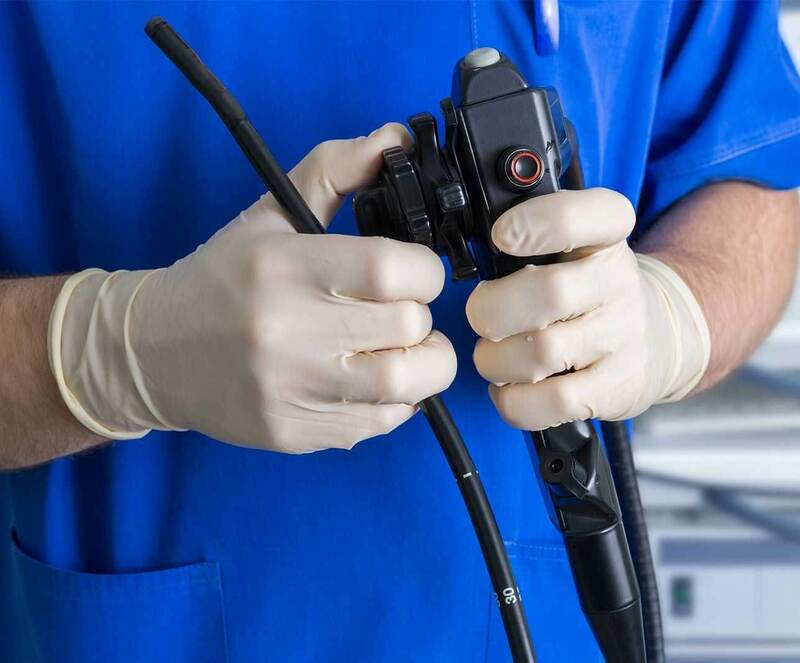 The endoscope is passed down the mouth and into the stomach for gastroduodenoscopy, or into the nose for rhinoscopy. Depending on findings, biopsy and/or culture samples may be obtained and submitted to a lab. Both procedures usually take 20-40 minutes. Nose bleeding is common following rhinoscopy and the pet is usually kept sedated while in the hospital to help with the bleeding, as stress and sneezing will exacerbate the bleeding. Pets who have had gastroduodenoscopy usually recover very quickly (depending on the type of anesthetic) and post-procedure pain, nausea or complications are rare. Patients go home the day of the procedure. Patients who have had rhinoscopy performed will often have mild nose bleeding and/or congestion following the procedure. Your veterinarian will discuss the gross findings with you, although if samples are submitted to the lab, these results can take up to a week or so, and often a definitive diagnosis cannot be made until those results are available. Because your pet will be anesthetized, no the procedure is not painful at all. There may be mild nausea following gastroduodenoscopy, although most patients show no signs of discomfort at all. Patients who have had rhinoscopy often are congested following the procedure, and nosebleeds can occur. Both procedures are considered very safe, although anesthesia is needed and depending on the health of your pet, there is always inherent risk of complications from general anesthesia. There is approximately a 2% risk for bowel perforation with endoscopy of the GI tract. This is very rare, but is of course very serious if it were to occur and would require immediate surgery. With rhinoscopy, the major risk is hemorrhage. This is typically mild and self limiting, although I did have one patient of the hundreds that I have done who had a severe nosebleed that required a blood transfusion. Will I know results immediately? Yes and no. Yes, you will be informed of gross findings (such as was there a foreign body or ulcer or mass), but biopsies are commonly obtained and thus microscopic findings may take up to a week. This is particularly true with GI diseases such as inflammatory bowel disease, a very common cause of chronic vomiting and diarrhea in pets.